You are here: American University Kogod School of Business News Women in Business. Women for a Cause. Kogod is proud to support student-led programs like the Kogod Women in Business (KWIB). The mission of KWIB is to support the goals of women in the workforce in order to advance women in corporate and government positions. KWIB won a national award for their advocacy for women in the workplace, and have been recognized for their continuous support for women in the world of business. 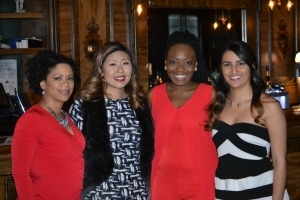 The 7th Annual Red Dress Gala was held at Capitale in downtown D.C., and all donations went to research efforts for the AHA. The night was filled with “uninterrupted fun,” a raffle that benefited the AHA, and a special guest speaker. The speaker at the event was Channing Muller, a member of the PULSE Young Professionals Group under the American Heart Association. Muller suffered two heart attacks in her twenties, despite living a healthy lifestyle. Because of funded research by the AHA, she finally received a diagnosis. Her message that night was that anyone can be affected by heart complications, and it’s important to raise money for this cause. The Red Dress Gala is an example of how KWIB is not only about networking, but is also dedicated to supporting their community. The Red Dress Gala displays the importance of paying it forward and empowering others through giving. Learn more about the Kogod Women in Business here.